Whoa. What even just happened? He’s dead. Man Accepting Award is actually dead, and he’s not coming back. That much is clear after a stunning series of images released last night on Shutterstock. It happened just like that. In one photo, Man Accepting Award was standing on an empty stage in front of a velvet curtain, hoisting an unmarked trophy aloft, smiling with the confidence of a man who has won an award. In the next, he was clutching at his chest, with jagged red EKG lines behind his body. We couldn’t believe it, but the appearance of Somber ER Surgeon left no doubt: Man Accepting Award is gone for good. It was one of those stomach-dropping moments that make us both love and hate the Shutterstock writers, who don’t shy away from shockers. Think of Angry Megaphone Man’s death in 2006, or the wreck that killed all five Carefree Promgoers in 2009. Woman Smoking Cigarette seemed fine before she abruptly became Skull Smoking Cigarette. We should’ve taken the hint: The Shutterstock universe is a cruel, cruel place. Still, this latest one feels like a real sucker punch. Man Accepting Award was actor Nicolas Maybury’s most beloved character, wildly popular among fans for his seemingly effortless ability to accrue trophies. Years ago, he won our hearts as Smiling Child With Medal. Since then, we’ve seen him grow up to become Man (20s) Accepting Award and finally Man (20s/30s) Accepting Award. 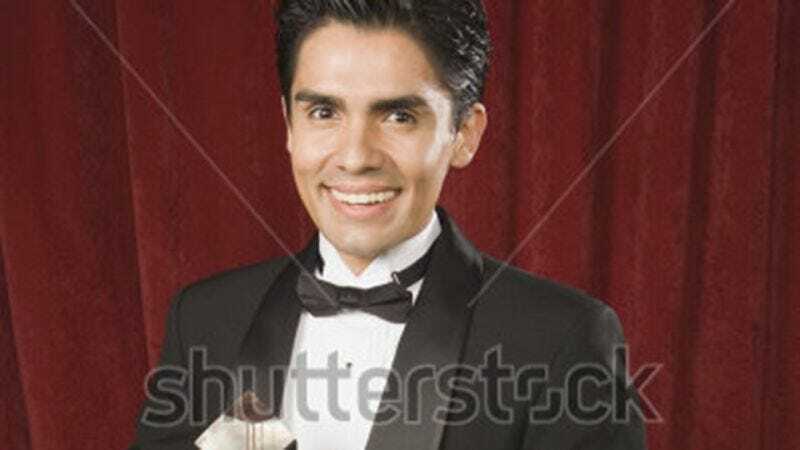 He’s had some truly iconic Shutterstock moments, like the time he received a coveted award from Group Of Impressed Judges, as well as the climactic series of five images in which he held two awards next to a podium. Throughout it all, he displayed undying devotion to Applauding Wife And Children—one of the most beautiful Shutterstock relationships ever. Well, we’re blown away. It’s just more proof that absolutely no one’s safe on Shutterstock—not Man Receiving Bad News On Phone, not Happy Woman Clutching Cash In The Desert…maybe not even (gulp) Disembodied Arm Protruding From Computer. A funeral story arc has already been announced, with Shutterstock execs hinting at the return of Mourning Family, Priest (50s) Delivering Eulogy, and new cast additions Black-Veiled Woman Holding Picture Of Man Accepting Award and Doctor Placing Trophy On Top Of Coffin. Man Accepting Award, you will not be forgotten!